In a small frying pan, melt the butter on medium heat. Add in the walnuts and stir with a spatula until the walnuts are lightly browned, about 5 minutes. Set aside. Line a 9-inch loaf pan with parchment paper. Preheat the oven to 350°C / 175°C. In a large bowl, sift together the spelt flour, buckwheat flour, sugars, baking soda, and salt. In a separate large bowl, beat the eggs. Beat in the bananas, melted butter, buttermilk, brown sugar and vanilla. Gently fold the egg mixture and toasted walnuts into the dry mixture, leaving in thin streaks of flour. Be careful not to over mix. Pour batter into prepared pan and bake for 55 minutes, or until a toothpick inserted into the center of the loaf comes out clean. Allow to cool in the pan on a cooling rack. 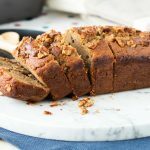 Get this recipe for Spelt and Buckwheat Banana Bread with Toasted Walnuts at https://www.theworktop.com/breakfast-brunch-recipes/spelt-and-buckwheat-banana-bread/.